The past two decades have witnessed a dramatic increase in the demand for analyses of health and public affairs program data. Governments at the federal and state levels have stimulated, if not mandated, much of this increased de­ mand and spawned numerous not-for-profit and quasi-public organizations­ research groups, lobbying organizations, consulting firms-who actively use analytic techniques. Program analysis is a broad term that encompasses activities such as pro­ gram planning and prediction, program assessment, and program evaluation. Though purposes differ and techniques vary, the common denominator for all applications is the attempt to use quantitative techniques to provide compre­ hensive and objective analyses. Program analysis in public health and public affairs shares another common feature: In many cases the data collected for these applications are categorical in nature-that is, discrete information rep­ resented by categories. Whether a defendant in a criminal trial is convicted (yes, no), the number of times a person visits a community health center in a month (0,1,2,3, ... ), how a person feels about a proposed program (agree, disagree, not sure, no opinion)-these are examples of categorical data. 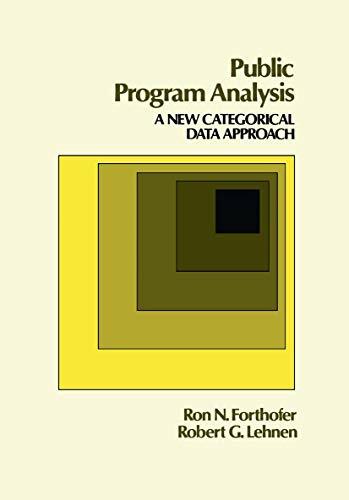 This book describes a multivariate categorical data analysis technique­ the weighted-least-squares (WLS) approach developed by Grizzle, Starmer, and Koch (GSK)-applied to program analysis in health and public affairs. It is written for in-service professionals who desire an introduction to applied cate­ gorical data analysis and for preservice students who are studying quantitative methods.